The Vatican called the vigil an unprecedented papal gesture for peace, by virtue of its scale and prominence of location. It took place the same day that U.S. Secretary of State John Kerry met with European leaders to make President Barack Obama’s case for a military strike on the government of Syria President Bashar Assad, as punishment for the alleged use of chemical weapons in the ongoing civil war there. At other times, as during the praying of the rosary in the first half of the vigil, prayers and readings alternated with music or performances on the organ, the harp and other string instruments. During the adoration, people representing five different countries or regions with direct or indirect links to the Syrian conflict — Egypt, the Holy Land, Russia, the United States and Syria itself — brought up incense to burn in a brazier beside the altar. Ten students from the North American College, the U.S. seminary in Rome, served as attendants. 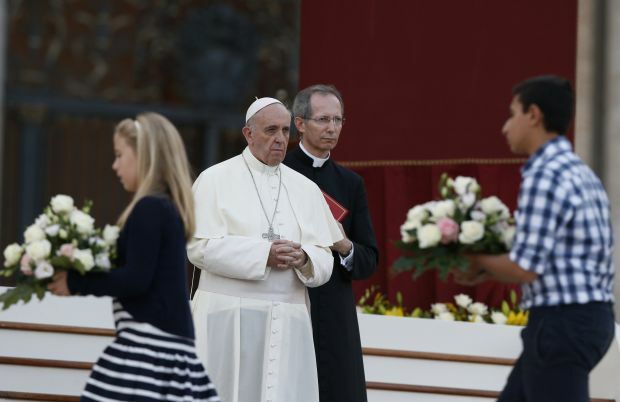 The atmosphere in the square was solemn, with none of the festivity of a Sunday Angelus or Wednesday public audience. Security guards confiscated flags and placards, though some Syrian flags and signs criticizing Obama could be seen on the periphery of the square. For more than an hour prior to the vigil, and then for the duration of the event, priests heard confessions in the square, sitting face to face with penitents on simple wooden chairs.